Essiac tea aggressive dose plus is recommended for individuals who are currently receiving chemotherapy and/or radiation, or who have been given a terminal diagnosis. Essiac can be taken during traditional cancer treatments without interfering with that treatment. If you are currently receiving chemotherapy or radiation, be aware that chemo and radiation can destroy some of the active properties of the essiac tea. * In other words, chemo and radiation can prevent essiac tea from doing its job to some extent. Taking 'extra' tea to compensate for this acts as insurance that the essiac you're taking will be able to do its work in your body. If you plan to continue along your chemo and/or radiation, you might consider taking up to 18 oz. of tea per day, or three 6-oz. doses. Many people on chemo and/or radiation have tried the 18 oz. per day with good results. However, some decide to stay with just 9 oz. per day, and many of those people have also had good results. You'll have to decide (along with the help of your practitioner) if you'd like to experiment with taking the Essiac Tea Aggressive Dose Plus, which is a full 18 oz. per day. This is what we suggest for those who are currently receiving chemo and/or radiation, or who have been given a terminal diagnosis. Note: The dosages that we're suggesting are measured in ounces of brewed tea, not in powder. Essiac at 6am. Breakfast at 7am. Snack at 10am, Lunch at 1pm. Dinner at 6pm. Essiac at 8pm. Breakfast at 6am. Essiac at 8am. Snack at 11am. Lunch at 2pm. Essiac at 4pm. Dinner at 5pm. Snack at 8pm. Essiac at 10pm. *If you are NOT on chemo and/or radiation, you may take just the traditional aggressive dose. Click here for the Essiac Tea Aggressive Dose Recommendations. 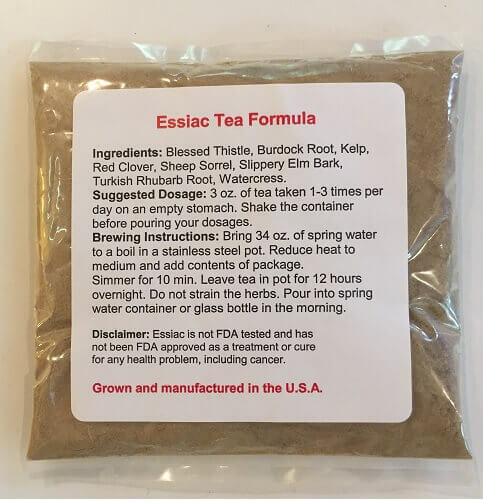 Click here to return to the essiac tea dosage recommendations page.